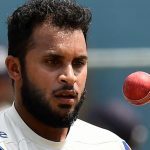 Congratulations to Adil Rashid on being selected as a member of the England squad for the 2016/17 tour of Bangladesh and India. The Yorkshire leg-spinner was awarded a Brian Johnston cricket scholarship when he was still a teenager, and the Brian Johnston Memorial Trust also helped to fund his coaching with Shane Warne’s legendary bowling coach, Terry Jenner, in Australia. Adil is the first former Johnners Scholar to play Test cricket for England and we wish him every success.